WIN and GAE community roundtable and call to action! JOIN WOMEN’S INTERCULTURAL NETWORK (WIN), and GLOBAL ARTS AND EDUCATION (GAE) for conversation and action on issues that matter at a COMMUNITY ROUNDTABLE AND A CALL TO ACTION! Caryl Ito has been a passionate advocate and volunteer for women’s equity and participation at all levels of the community for over 30 years. She was one of the founding members of a national Asian pacific women’s movement in the late 80′s which resulted in the development of the local bay area group, pacific Asian American women bay area coalition(PAAWBAC). a 30 year old nonprofit organization. Caryl served under 3 mayoral administrations, as president of the San Francisco commission on the status of women and helped to reconstitute this commission in 1989. She played an integral part of the citywide ballot measure to ensure that this commission was part of the city charter. Born and raised in California but traveling throughout the United States and Europe, Asia and parts of the Caribbean Devorah Major served as San Francisco Poet Laureate 2002 through 2006. In addition to being a poet she is a performer, lecturer, fiction and creative non-fiction writer, and editor. A trained actress and former dancer, she approaches poetry as both a written and performing art. In 2009 she completed a historical novella and accompanying non-fiction essay Freedom’s Harvest: The Peter Smith Story that is now traveling the nation looking for a publisher. 2009 also saw the release of two new chapbooks, Black Bleeds into Green and Amour Verdinia/Verdinia Amour, a two-poet flip book with Opal Palmer Adisa. That was also the year that she completed and gave her first performance of Black Classic: African American VOices from 19th Century San Francisco. She finds talking about herself in the third person to be very tedious. Although the bio slips back to 2005 in the next paragraph she in fact wrote, performed, traveled, loved and cared for friends and fmaily during each of the years from here til then. In 2005 Trade Routes, a symphony commissioned by the Oakland East Bay Symphony composed by Guillermo Galindo, with spoken word and chorus by devorah major was premiered at Oakland’s Paramount Theater. devorah major has performed solo, with jazz musicians, and as a part of Daughters Yam with Opal Palmer Adisa. In 2006 ms. major participated in an International Poetry Festival and Conference in Sarajevo, Bosnia. 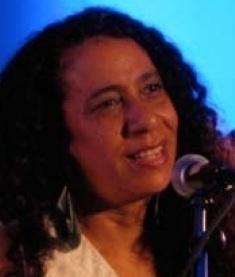 In 2007 she made a fourth trip to Italy to be a part of an international poetry festival presented by Casa della Poesia, (http://www.casadellapoesia.com). In 2007 she was also featured poet in Miami-Dade’s Asili Poetry Festival. In 2004 she presented her one woman show The Logics of Love in AfroSolo’s Summer Arts Festival. In the Spring of 2004 she toured the Northeast United States and also performed in Jamaica’s annual Calabash International Literary Festival. In 2002 she performed at the Dodge Poetry Festival, Litquake, and the Webbies. She has performed in several venues in Southern Connecticut over the last four years. In September and October of 1996 major toured England and Wales as a performance poet. In Spring of 1990 she was an actress in the Eureka Theater’s production of Lewis Jordan’s “But Time Will Take You Out…”. In 1993 and 1994 she was the featured poet in the modern Afro-Cuban ballet Si Como No which was produced at several Northern California theaters. In 1995 she worked as a performance artist with Beatriz Ross Cultural Dance Ensemble’s production of Creative Visions of Ourselves. She also presented a one-woman show as a part of California State University’s 1995 Summer Arts Festival. Among the venues in which she has performed in the last three years are The Noh Space, National Poetry Week at Fort Mason, the Eureka Theater, Footworks Dance Studio, New Performance Theater, Yerba Buena Center for the Arts, Life on the Water, the Intersection, Koncepts Cultural Gallery, Kimball’s, Great American Music Hall, The Upper Room, the Elbo Room, the Kennel Club, the Oakland Museum’s James Moore Theater, as well as a host of libraries, bookstores and university and college poetry centers around the country. In August of 2005 Daughters of Yam (a poetry performance duo with Opal Palmer Adisa) were featured at Lincoln Center’s La Casitas Festival. In April of 2003 they were featured at the San Francisco Jazz Festival. In January of 2001 Daughters of Yam wrote and presented “World Affairs”, a poetry performance ritual with music, at Venue 9. In May of 1996 Daughters of Yam wrote and starred in “Jump the Sun,” a full length poetry/drama presentation produced by the Oakland Ensemble Theater. devorah major is featured on a number of poetry recordings including Daughters of Yam’s Fierce//Love, and poetry compilations including Wild Poppies, Who Sane Who Sane and America Fears the Drum. She has also shared her work on radio and television stations in Northern and Southern California, Southern Connecticut, New York, New York, and Atlanta, Georgia. ms. major continues to perform her work in clubs, theaters, and cultural centers. She is currently an adjunct professor at California College for the Arts and poet-in-residence at the San Francisco Fine Arts Museums . Charlie Toledo is a Towa descendent, native to New Mexico. She is the Executive Director of the Suscol Intertribal Council a community-based organization (501©3) incorporated in 1992 located in Napa, California.She is past Chair of the Women’s Intercultural Network and Regional Representative to the California Women’s Agenda from Napa and Pope Counties. She also has been in private practice as a certified masseuse, certified hypnotherapist and meditation teacher since 1982. She has extensive experience as public speaker, presenter and community organizer in regional, statewide, national and international forums. She has over twenty years in alternative healthcare fields, as well as background in consultation for problem solving and stress reduction for individuals, families, and organizations. She has been an organic gardener since 1978. She has a lifelong commitment to social justice and international work on Human Rights. Watch our Facebook and e-news for more information • $15 for students, $25 for public, or all you can donate to give women and girls a larger, louder, smarter voice. Payment accepted by check, charge, or at the door. No one will be turned away!